A “hopper” is a container for a bulk material such as grain, and barley just so happens to be a grain. Place these two words next to each other, they go beyond their literal grainy meanings and create the title of a band that has been said to “burn up” stages playing an infectious country, rockabilly, and a rock ‘n’ roll style of music. 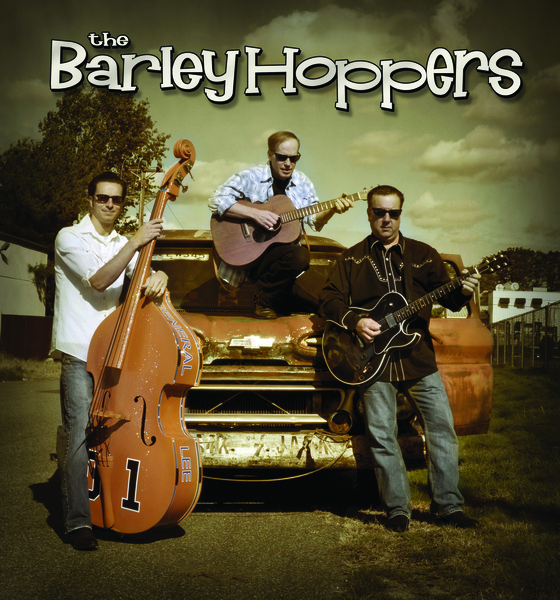 The Barley Hoppers, Stan Kozlowski on vocals and rhythm guitar, Ray Reniere on lead guitar and backing vocals, and Mike Volatile on Upright Bass deliver their red-hot bluegrass styling on their self-titled album. Produced by Joe Moody at Danger Multitrack Records in Providence, the compilation is a short and sweet twelve track album with only a single song breaking three minutes. However short the tracks may be each one delivers two-stepping tunes that make sitting still nearly impossible. Much of the album offers upbeat foot-tappers, apart from the track “Lonesome Train” which slows things down and shows a softer side of the Barley Hoppers. Other instruments used in the album include a fiddle, a steel guitar, a harp, a snare drum, and a banana box (yes, a banana box). In contrast to the large repertoire of instruments, the Barley Hoppers lyrics stay simple, yet catchy and cleverly written with lines like, “Well I’m hardly ever broke, but I’m usually always spent, when it comes to lovin’, baby I don’t need a cent” from the third track “Servant of Love”. I would like to buy one for my Mom…how do I do that?